Ronald T. Crawford’s paintings reflect both the theoretical and physical aspects of his life. On the one hand he has an extensive fine art education and has been exhibiting his work for over 30 years. 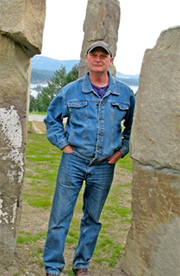 On the other hand, for the past 25 years he has had extensive experience working on Salt Spring Island with functional and sculptural stonework. His multifaceted paintings are the result of the blending of contemporary painting concerns with the earthy spiritualism of stone. These works are made with a unique combination of plaster and acrylic paint, resulting in a modern variation on the frescoes. The surfaces are carved, shaped, sanded and painted until they take on a rich, naturally eroded appearance. The physical depth of the plaster gives a real surface for shadow and light to alter and enrich the image. Within the plaster, natural and man made patterns co-exist in an uneasy alliance of form.